Key Ovation’s Goldtouch ErgoSecure2.0 Adjustable Smart Card Keyboard has recently met all HSPD-12 hardware requirements specified in the FIPS 201 Evaluation Program. The Goldtouch ErgoSecure2.0 is one of only two keyboards approved on the FIPS 201 list. AUSTIN, Texas, July 18, 2007–Key Ovation, manufacturer of the leading Goldtouch line of ergonomic and security products, has announced that the Goldtouch ErgoSecure2.0 Adjustable Smart Card Keyboard meets all HSPD-12 hardware requirements specified in the FIPS 201 Evaluation Program. “We are very proud and excited about the acceptance of the ErgoSecure2.0 Adjustable Keyboard for HSPD-12,” says CEO Peter Gilbert. The Goldtouch ErgoSecure2.0 is one of only two keyboards approved on the FIPS-201 list, meaning those agencies seeking to roll out HSPD-12 will be able to address not only the physical/logical access requirements (via the integrated smart card reader), but also the needs of a physically diverse–and, in some cases, symptomatic–workforce. According to Christopher Lowe, VP of Sales and Marketing, that translates to significant cost savings for agencies looking to accommodate workers with special needs per Section 504/508, and for President Bush’s SHARE initiative, which challenges federal agencies to reduce Workers Compensation costs and get injured workers back on the job as quickly as possible with reasonable accommodation. Gilbert adds, “When you combine the cost savings of a secure Identity Management platform and access control to Federal properties, with the financial benefits of fewer missed work days and lower injury claims costs by use of the Goldtouch, there is no other solution that can compare. Headquartered in Austin, Texas, Key Ovation offers safety and security solutions for the workplace that impact the bottom line and create a healthier, more productive working environment. 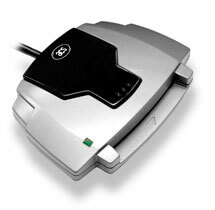 Key Ovation is the manufacturer of the celebrated Goldtouch line of ergonomic products for both home and office. Key Ovation’s Goldtouch product line includes ErgoSuite, a bundling of ergonomically designed desktop peripherals. Each device has been ergonomically engineered using world-leading technology to help reduce repetitive stress injuries (RSI). For more information, visit http://www.keyovation.com.